Ludwig Meidner (Bernstadt, Silesia, 18 April 1884 - Darmstadt, 14 May 1966) was a German expressionist painter and printmaker. Following his parents' wishes the young Meidner began an apprenticeship as a mason, but broke it off. In 1903 he was admitted to the Breslau Academy for Fine Art and the Applied arts, which he left after two years to move to Berlin. 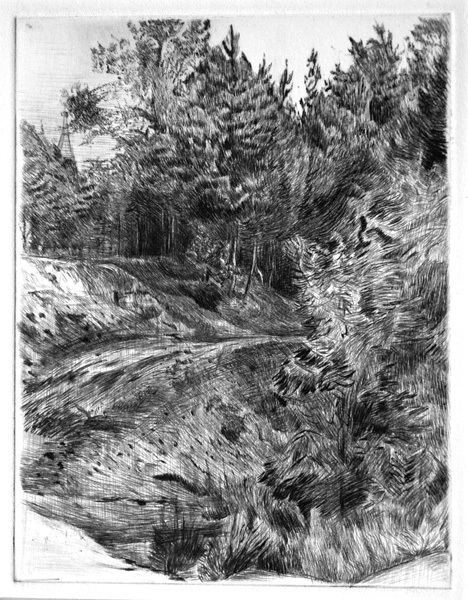 The instruction he took in etching from the artist Hermann Struck was important for his later career. Meidner only did a few paintings in his early Berlin years: "Industrial Urban Landscapes," which resemble the work of the French Fauves formally and in the palette he chose for them. Meidner was interested in the aggressive suppression of nature by the expanding metropolis, which he described as eerily menacing, rather than the aesthetic of urban architecture. In 1906 he went for about a year to Paris, where he met Amedeo Modigliani. 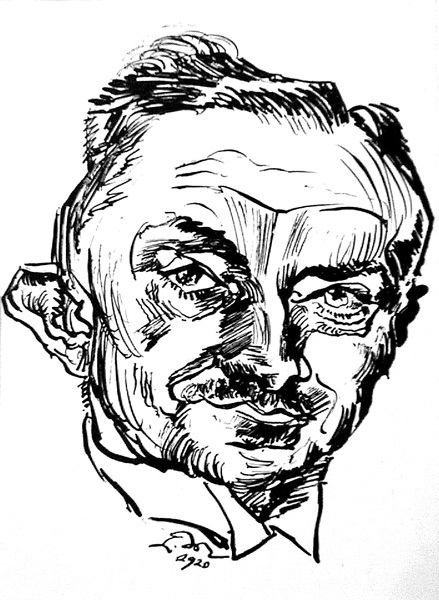 The years that followed in Berlin saw Meidner haunted by dire financial straits although he intensively experienced Expressionist bohemian life. His favourite sitters were the men of letters who were his friends. The year 1912 was an important one for the artist: he painted the first of his compelling self-portraits and "Apocalyptic Landscapes." These works anticipate the horrors of the first world war by several years. The series, produced rapidly in a hectic heatwave, are some of the purest "expressionist" works, portraying the terror of the modern city in catastrophic setings; comets cross the sky like canon shells, fires rage, men scream and flee for their lives, buildings totter on the edge of collapse. He also joined forces with Jacob Steinhardt and Richard Janthur to found "Die Pathetiker" ["The Exponents of Pathos" or "The pathetic ones"], a group that showed their works at Der Sturm, Herwarth Walden's gallery. There he met Robert Delaunay, whose Orphic Cubism, with Italian Futurism, inspired his style. Plagued by existential fears, he turned to painting religious themes. Conscripted into the military in 1916, Meidner served as an interpreter and censor at an internment camp for prisoners of war. There he began to write. After the war he joined the "Novembergruppe" [November Group] and the revolutionary "Arbeitsrat der Kunst" [Workers' Council for Art] in 1918. Disappointed at the failure of the Revolution, the artist retired to nurse his disillusionment in private, abandoning Expressionism, which by then was so popular that its commercial outlook increasingly brightened. In "Autobiographische Plauderei" [Autobiographical Chat] he offended companions and friends by repudiating his early work. Religious themes, landscapes, still lifes and more portraits would thenceforth be his dominant genres. He was a habitual self-portraitist producing a remarkable series of Rembrandt-inspired self-portraits that provide a vivid illustration to his passing years. His portraits from 1915 to the end of the 1920s are a gallery of the leading expressionist and Dada writers and poets. Denounced as "degenerate" in 1933 and persecuted because he was a Jew, in 1939 he fled with his family to England (his wife Else Meidner was also an artist) where he was interned as an enemy alien on Isle of Man. He stayed in England, unrecognised, working in odd jobs until 1952 when he returned to Germany. In a last, very productive, creative phase he further developed the style of painterly realism he had developed in the 1920s. In 1963 he had his first major exhibitions since 1918 in Recklinghausen and Berlin. He died on 14th May 1966 in Darmstadt, aged 82. (Information developed fromWikipedia and http://www.ludwig-meidner.com/). Select Bibliography: (Milwaukee: Milwaukee Art Center, 1976); Carol S. Eliel, The Apocalyptic Landscapes of Ludwig Meidner (NY: Prestel-Verlag, 1989); 1884 - 1966. Das Druckgraphische Werk (Hofheim: Stadt Hofheim am Taunus, 1991); T. Grochowiak, Ludwig Meidner (Recklinghausen: Verlag Aurel Bongers, 1966); Manfred Schlösser, Meisterzeichnungen von Ludwig Meidner. 18.4.1884 - 14.5.1966. Zum 100.Geburtstag (Berlin: Berlin Akademie der Künste, 1984). Der Windhimmel (Davis-Rifkind 1927: 12). Original lithograph, 1920. Published by Paul Cassirer (1920) in Berlin as part of the regular edition of Septemberschrei / September cry. There was also a deluxe edition of 100 signed and numbered impressions apart from the book edition (for which Meidner wrote the text). Initialed and dated in the stone lower right. Image size: 210x149mm. Price: $1750. Bildnis / Portrait (Davis-Rifkind 1931). Original lithograph, 1920. As published in Kurt Pfister, Deutsche Graphiker der Gegenwort (Leipzig, 1920). 600 impressions initialed and dated in the stone bottom center-left. Other contributors to this important manifesto of "German Printmakers of Today" included Lovis Corinth, Max Liebermann, Kathe Kollwitz, Max Slevogt, Hans Meid, Rudolf Grossman, Alfred Kubin, Paul Adolf Seehaus, Paul Klee, Georg Grosz, Edwin Scharff, Ernst Barlach, Christian Rohlfs, Erich Heckel, Emil Nolde, Richard Seewald, Heinrich Campendonck, Otto Mueller, Max Pechstein, Karl Schmidt-Rottluff, Lyonel Feininger, Conrad Felixmuller, Max Unold, Karl Caspar, Rene Beeh, Max Beckmann, and Oskar Kokoschka. Image size: 250x190mm. Price: $1500. Bildnis Eugene George / The Occultist (Davis-Rifkind 1932). 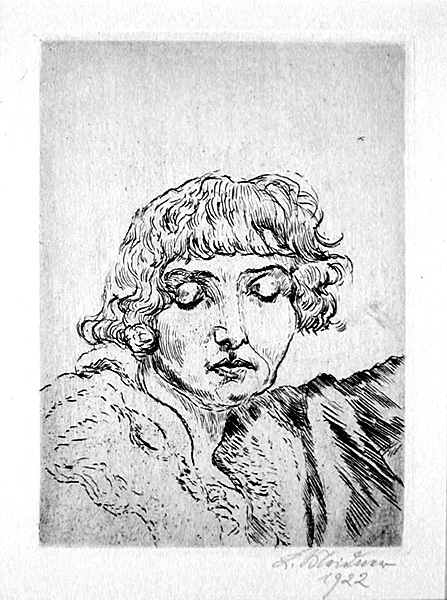 Original drypoint, 1920. A posthumous impression on wove paper. Stamped on the verso: Nachlass Ludwig Meidner and inscribed III / 64. Printed by Wolfgang Blauert with the approval of Meidner's estate. Illustrated Grochowiak, pl. 135. Image size: 195x177mm. Price: SOLD. Frau Bella Chagall (Grochowiak 1360, Davis-Rifkin 1938). Original etching, 1922. Edition unknown; ours is a brilliant signed impression dated 1922. 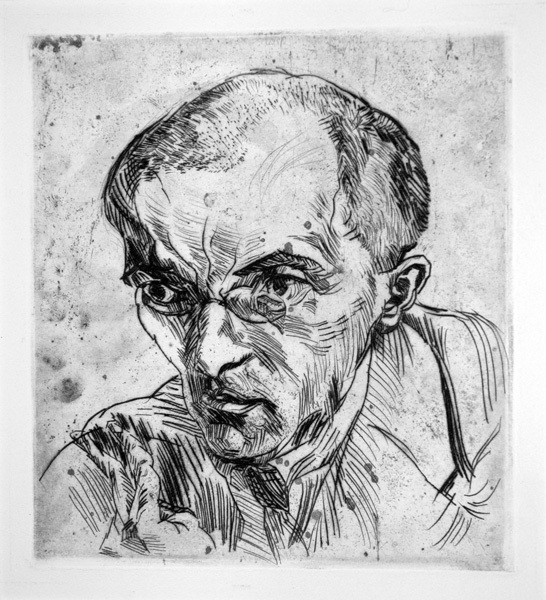 The impression in the Rifkin Collection of German Expressionist Art at the Los Angeles County Museum of Art is annotated "Nachlass Ludwig Meidner" and signed by the printer; ours is may be an artist's proof of a work that was not editioned during Meidner's lifetime. Meidner was a friend of the Chagalls, and his portrait of Bella Chagall as a flapper is a charming testimonial to their friendship. Illustrated Grochowiak, pl. 136. Image size: 177x127mm. Price: $3500. The writer Wilhelm Lehmann. 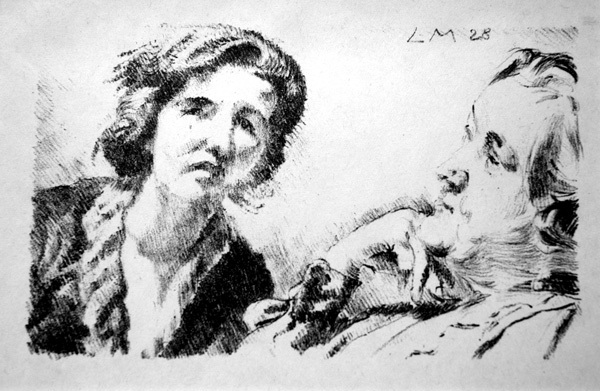 Original drypoint, 1927. Edition unknown. Ours is a posthumous impression on a large sheet of wove paper with the estate signature stamp lower right in blue ink (here printed in black). 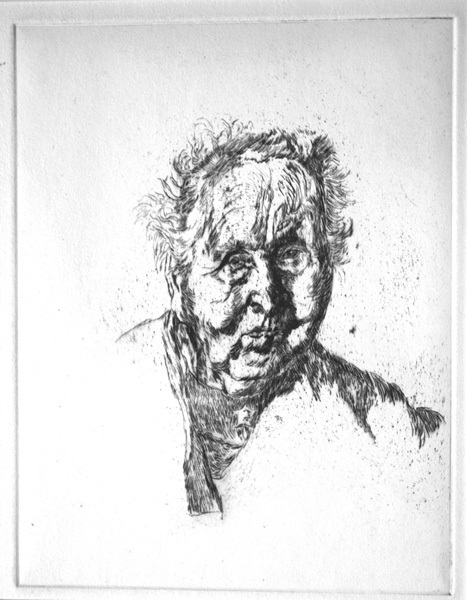 Drypoint is a very fragile medium. An impression this rich is unlikely have been made from a plate that had had more than 30 impressions printed from it prior to this one. Image size: 177x127mm. Price: $1250. Grasni from the old people's home. 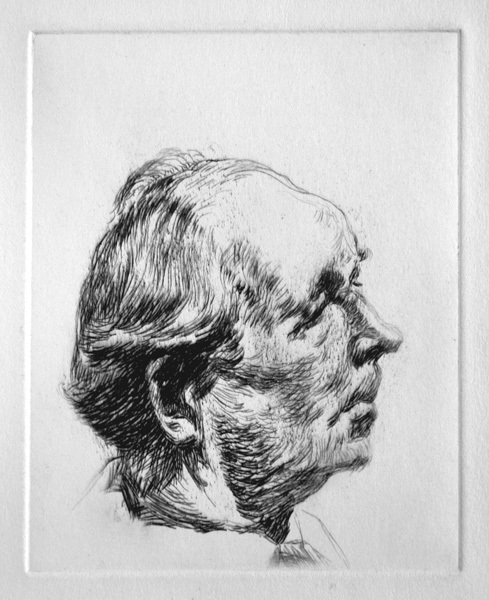 Original drypoint, 1939. Edition unknown. Ours is a posthumous impression on a large sheet of wove paper with the estate signature stamp top left on the verso in blue ink (here printed in black). Drypoint is a very fragile medium. An impression this rich is unlikely have been made from a plate that had had more than 30 impressions printed from it prior to this one. Image size:178x137mm. Price: $1250. Couple. 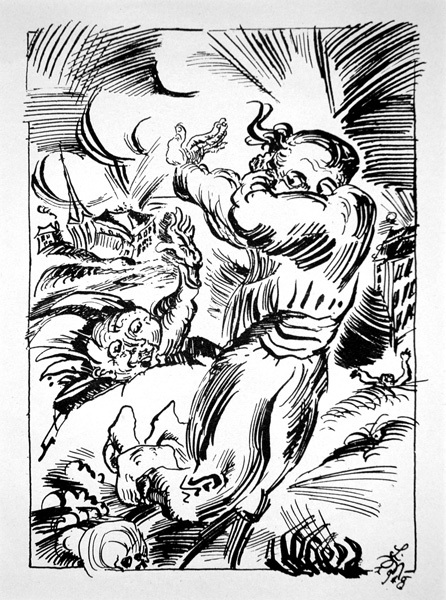 Original lithograph, 1928. Edition unknown. Ours is initialed and dated in the stone. Image size: 100x163mm. Price: $1000.